I don't use instructions, and I didn't memorize the in﻿structions. I worked it out all by myself. And I'm not sure how, really. I can't quite believe that I could, now that my brain power is significantly diminished, being post 40 and all. I just remember sitting with it for hours and hours while I watched TV as a teen. Until, bingo, I cracked the code! I can still do it now, usually in under 5 minutes. Definitely in under 10 minutes. I can't imagine sitting with anything for so long now, trying to solve the mystery. Have you lost brain power?? Do you have a sneaky talent that no one knows about??? I've solved it once, but it must have been by fluke, because I certainly could never have done it in under five minutes. I might get one for the kids next birthday and see if I can master the challenge! Strange things happened to my post. Hopefully the third time is the charm. 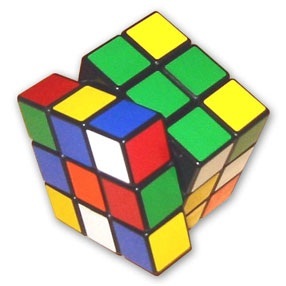 I remember sitting with the Rubiks Cube when it first came out until I "got it." Today, even at almost 60, I can focus on a project for hours if I am interested in it. I often do when working on a photo in Photoshop or some other technical task. Oh my gosh are you freakin'SERIOUS people!!! I thought that thing was virtually unsolvable except for geniuses! Well there you are, three geniuses all in the one spot! I am so impressed with you right now. It took me a while to think something up but (apart from speaking fake Spanish), I can snap my fingers REALLY loudly. *SNAP SNAP SNAP*!! Never in my life have I solved that thing. Not even the cheaper 3 x 3 square versions. Kudos to you! I played with the cube for some time...gave up!